An end-of-summer favorite, sour cherries mixed rice is among the long list of Iranian polow — that is, plain rice layered with cooked or fried grains and herbs, vegetables, prunes or fruits. Sour cherries rice tastes- well, obviously, sweet-sour, it is dark-red in color, and is often served in large gathering either along with fried chicken on the side or with meat balls in the dish. Most importantly, just around this time of the year in Iran, an authentic albaloo polow is made with fresh, hand-pitted and home-processed sour-cherries. Having been deprived of fresh sour cherries here in Montreal, I had been only dreaming about the good old days albaloo polow for the past couple of decades. I did embark on making this delicious dish with frozen and canned sour cherries more than once, but failed miserably each time, for the mix turned too mushy for the cherries to be even recognizable in the platter.As in happy ending stories, though, a good friend of mine recently shared his discovery about making an almost perfect albaloo polow, using Canadian semi-dried sour cherries. I must tell you this is the closest you can get to the traditional albaloo polow in absence of fresh sour cherries. Rinse the rice before soaking it in lukewarm water with 2 tbsp. salt for at least 4-5 hours. In a bowl, soak cherries in lukewarm water for 2 hours. Pour off water from the top of bowl. Transfer cherries in to a small pot and add sugar and lemon juice. Let it sit for another 2 hours. 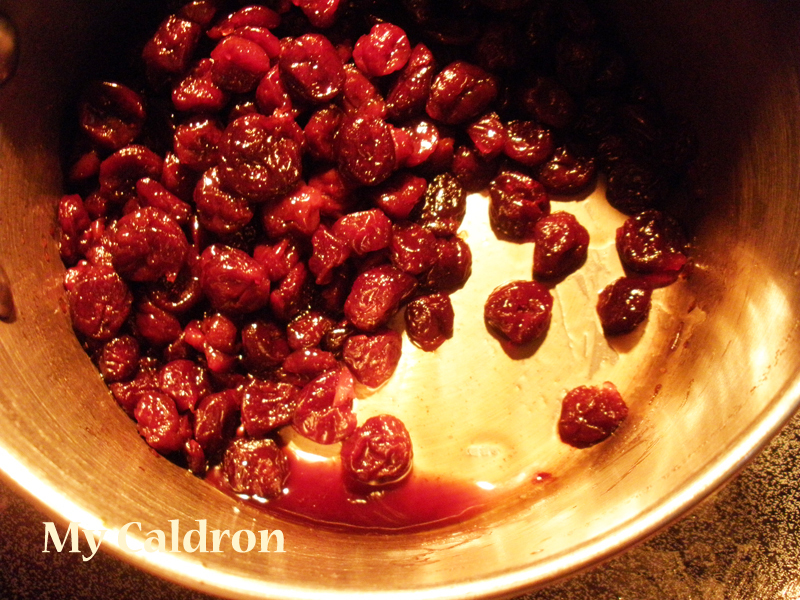 Simmer on minimum heat with closed lid, until you get soft cherries and 2-3 tbsp. of thick reddish juice at the bottom of the pot. Put aside. Fill a large pot three quarter full of water and bring to a rolling boil. Pour off the salted water from the top of your rice bowl and add the rice to the boiling water. Drain in a fine-meshed colander and give it a few good shakes. Wash off the starch from the pot and put it back on top of the stove to get it completely dry. 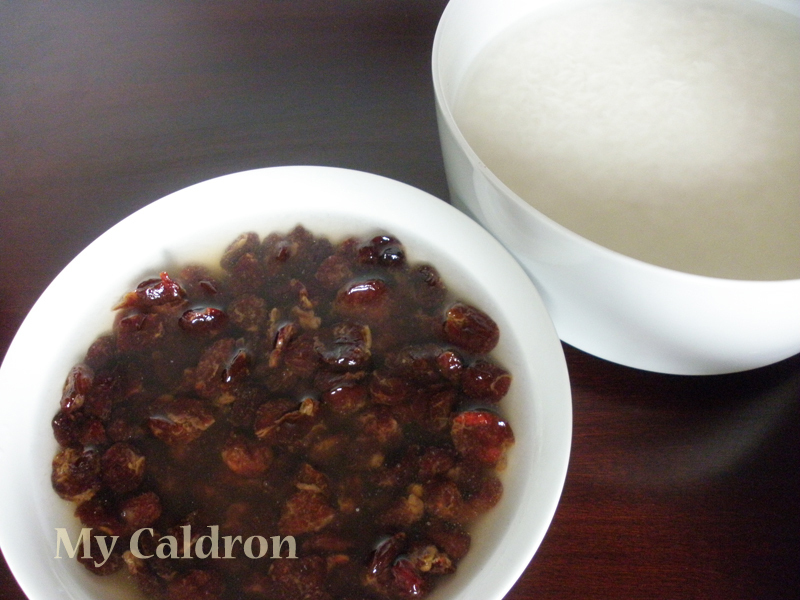 Make a well In the middle of rice and pour in the cooked sour-cherry along with its juice. Using a fork, build the rice mound into a pyramid shape. Sprinkle saffron powder over the rice. Spread a 2-3 tbsp. heated oil over the rice. With your fork’s handle, make a hole in the center of the rice mound and cover. Once enough steam is built inside the pot, warp the lid in clean kitchen towel and put it back on. Turn the heat to minimum and steam cook for 45 minutes. The steaming process releases saffron scent and color, and it also make cherries juice penetrate deep into the rice. Still, you will have a denser layer of cherry and saffron on top of the rice pot. To mix, scoop out a part of top portion in a small plate. 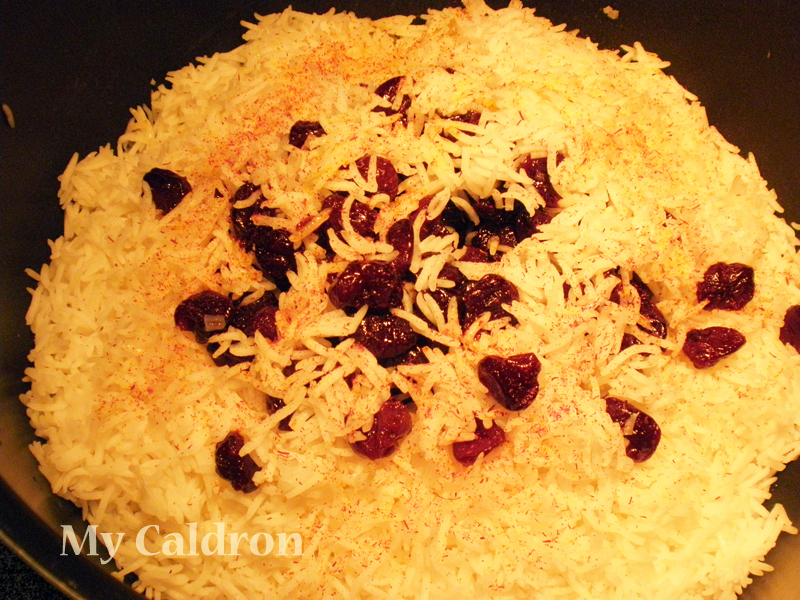 Serve the remaining rice and sour-cherries on your main platter while mixing them gently. Scoop back the top portion on top of the serving platter. Serve hot on its own, or with fried or roasted chicken if you wish, such as this one. 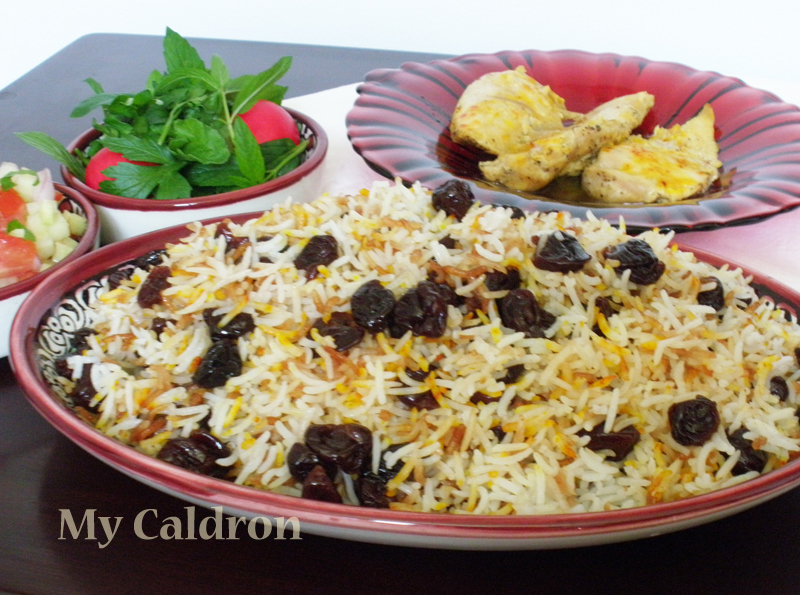 Side dishes such as assortment of raw herbs, sabzi, and shirazi salad are always good with mixed rice.